Well ~ a HUGE thank you to all of you that left such lovely and kind comments on my last post about Sorrell ~ she is continuing to do well and is back to her old self, the only one thing I have noticed is when I was grooming her last weekend ~ she has about three or four little scabby patches here and there on her skin ~ very strange, I have decided to leave well alone having investigated one of them and found it to be quite clean? Ever since that dreadful weekend I have been playing catch up with my chores and that has left little time for playing with my crafty goodies. But, it was Father's Day here in the UK last Sunday and I thought I would show you the card I made for my Dad. I kept the card quite simple as the image is quite a large one and sort of took the whole thing over! Well thats' all for today ~ it has just started raining here, which would be about right as Hubby has Friday and Monday off! Thank you all for stopping by and for any much appreciated comments you may make. Soooo pleased to hear Sorrel is back to her old self!!! They seem to bounce back very quickly once they have the right care don't they. Glad it all worked out okay in the end. Lovely card and I agree, keeping it simple has kept the image as the main feature, love your colouring/shading. Such a sweet image Bev and I love the colours and design. 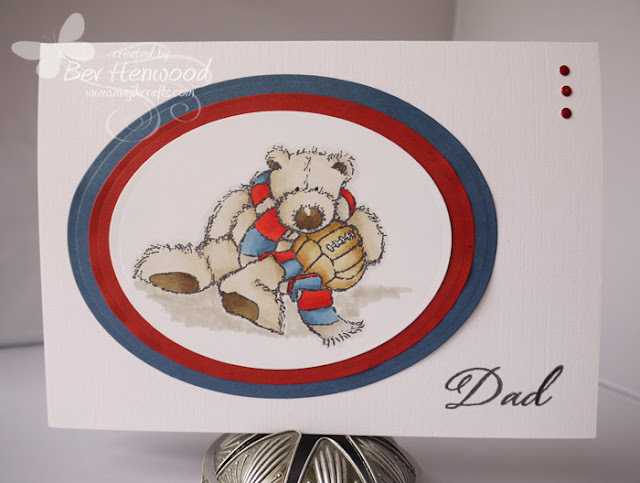 Such a lovely card with this bear and so pleased to hear Sorrel is fine. What a fun creation! Your coloring is fabulous and the design is perfect ... really showcases this adorable image! Thanks so much for joining us at The Sisterhood ‘One For The Boy’s’ challenge and please come back again soon! super cute and lovely card Bev. 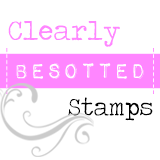 Thanks for join us at DigiStamp4Joy. Such a beautiful simple card Bev, love the colours! Thanks for joining us at Digistamps4Joy. Wonderful card, Love the image! oh so cute - lovely!